Week 15 – How God works in mysterious ways. Raised Catholic, I spent every Sunday morning at church with my family. We’d file in, one-by-one, all nine of us, and sit in a pew near the front of the altar so we could watch the priest as he said Mass. Today, staring at the coffered ceilings, the stained glass windows, and the mighty arches overhead, I was transported back in time. My body knew the rituals by heart. Stand. Sit. Kneel. Stand. My mouth remembered every prayer. My spirit lifted as I listened to the thundering organ and felt the sacredness of ceremony. When we sat down for the sermon, I stared at a young girl – maybe ten years old – sitting in a pew in front of me. She had long, dark hair and she wore a pale, pink dress with a matching ribbon tied in a bow around her ponytail. Wiggling back and forth, doing her best to sit still, I smiled as I remembered my own restlessness as a kid in church constrained by the fear of getting ‘the look’ from one of my parents. Watching her, I felt emotion well up inside me, bringing unexpected tears to my eyes. I lowered my head and squeezed them shut, unsure about what prompted this reaction. I took a slow, deep breath and tuned in. This is where my spiritual life was born, I thought to myself, the place that introduced me to the love of God and the belief in a power greater than my small self. These are the rituals that formed the spiritual backbone that, to this day, supports my life, my work, and my soul. This may be where my love affair with beauty began. I felt overwhelmed with appreciation for my mom and dad’s commitment to instill in us a reverence for the sacred in spite of our resistance. I’m sure we complained a lot about going to church. It’s funny how things change with the wisdom and maturity of age. Over the years, as my spiritual life widened and expanded to include the rituals and teachings of other faiths, I lost touch with my Catholic roots. Today, it felt good to revisit them again. At the end of the Mass, something beautiful happened. As I walked out of the church, the priest who led the service smiled as I passed by and, when my friend stopped to introduce us, he threw his arms around me before she barely said a word. He hugged me tight and began to recite a blessing, asking God to fill me with love, to protect me, and to give me what I needed to continue making my way in the world. I stood there, returning his embrace, a little stunned at his warmth and informality. When finished, he stepped back and looked me in the eye. Then he started laughing. “You get it, right?” he said to me. Yes, I get it, I replied, without a second thought. My head unsure, but my heart and soul fully onboard. 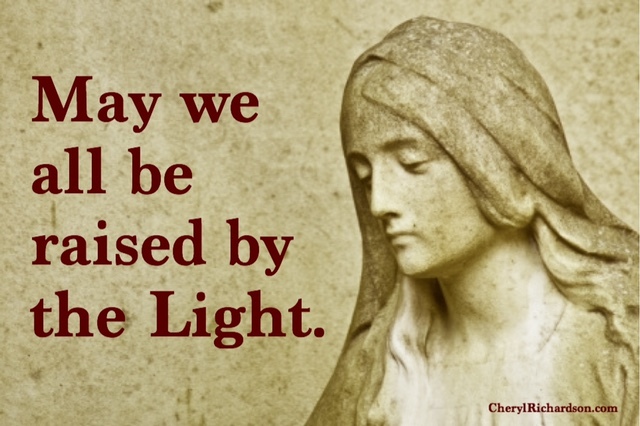 Happy Easter to you and yours… may we all be raised by the Light. This week’s video demonstrates how we can all help raise each other up. You can see it here.